Laying Instruction | Tiles Carrelage Pvt. Ltd.
Plaster the surface of the floor where the tiles will be laid with smooth finish and complete the plastering and curing at least two weeks prior to laying. Before Fixing Tiles Carrelage tiles, lay them out in desired pattern and make sure that they give an acceptable blend of colour. Please note that certain amount of shade variation is inherent in manufacturing of fully vitrified ceramic tiles. WE WILL BEAR NO LIABILITY AFTER THE TILES ARE FIXED. The brand bears no responsibility towards the tiles exposed to any outside process like transfers, Printing , firing etc. For Fixing, We recommend the use of tile fixing adhesives for best results. Also follow fixing instructions provided along with adhesives. B. Once the mixing has completed do not add any further water and use the same within one hour. C. Apply a 20-30 mm, layer of bedding material over an area of 1 Square meter at a time on the surface of area. D. Apply a fine slurry to the back of the tile to ensure proper and full bedding. Press gently for even adherence at the back of tile. DO NOT USE AN IRON HAMMER OR SOME HEAVY MATERIAL TO PRESS THE TILE. 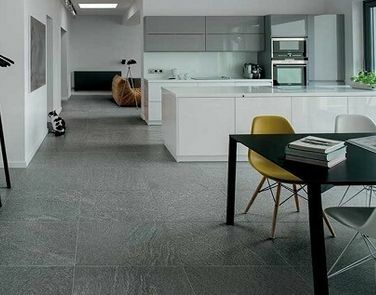 For fixing Tiles Carrelage tiles on Dado, We recommend the use of tile fixing adhesives with proper troweling method for 100 percent coverage behind the tiles and for peerless bonding. Please follow manufacturer’s instructions for the same. We do not recommend the use of sand and cement for fixing Dado. Make and lay out tiles from the centre of the area to be laid so that cut tiles, if any, will be on the outer edges towards the wall. The work size which we try to maintain for better technical performance is 600 X 600 mm on average. It is advisable to maintain a gap of 1 mm to 2 mm between every two tiles to allow possible expansion as per BIS/EN tolerance norms. Complete the laying process by pressing the cut tiles firmly into place along walls / floors. Allow 3-4 days of for bed curing after this period fill the joints with grouts. Usage of grout sealant is recommended for keeping grout free of dust. Fifteen minutes after finishing the grouting process, wipe off excess grout with a damp sponge and polish the tiles with a soft and dry cloth for cleaned surface. The tiles can also be cleaned with mild acid ( However, Hydrofluoric acid and its derivatives should not be used). Please note that the brand does not accept any liability in case of problems arising out of non-adherence to these fixing instructions. NOTHING IN THESE INSTRUCTIONS IS A SUBSTITUTE FOR GOOD WORKMANSHIP AND SUPERVISION.